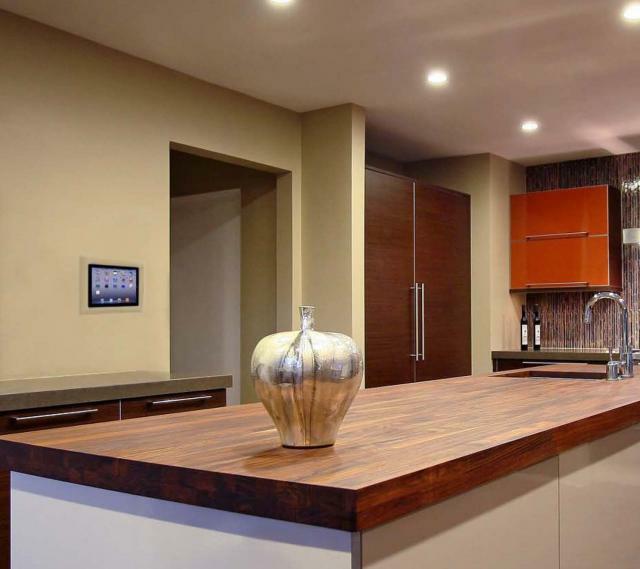 A 'Smart Home' automation innovation. Turn your iPad or iPad Air into a convenient home automation controller, music server or home theatre control touch screen with this innovative semi-permanent wall mount. Also available in iPad Mini and iPod Touch models. 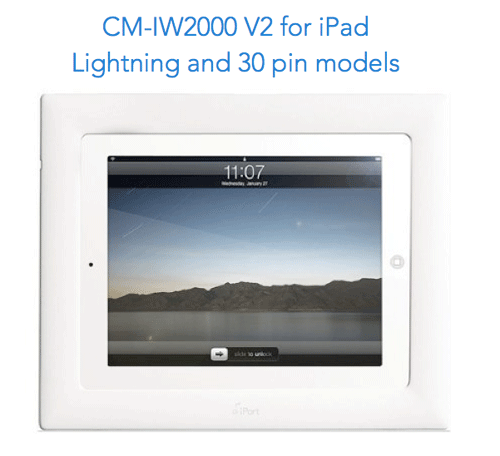 The CM-IW2000 is made to securely flush mount your iPad into your home's wall. Sporting an attractive but thin and discreet frame magnetically attached to the mount, it presents a striking and functional aesthetic result. 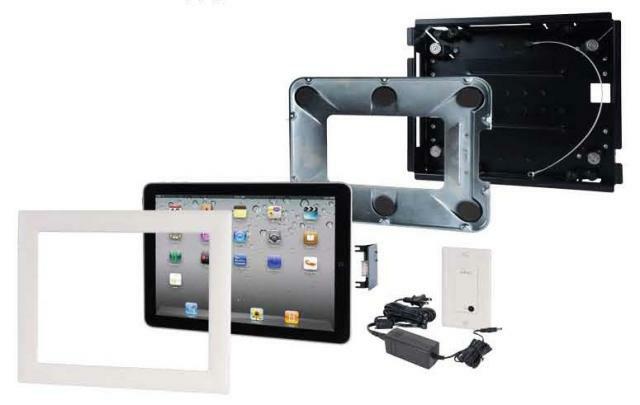 If paired with either a Clipsal Wiser Home Control or a Push Controls remote control package, these mounts with an iPad fitted provide a remarkably well priced alternative to fixed use automation touchscreen systems with the benefit of a much larger screen format and more feature rich application platform (See related products). 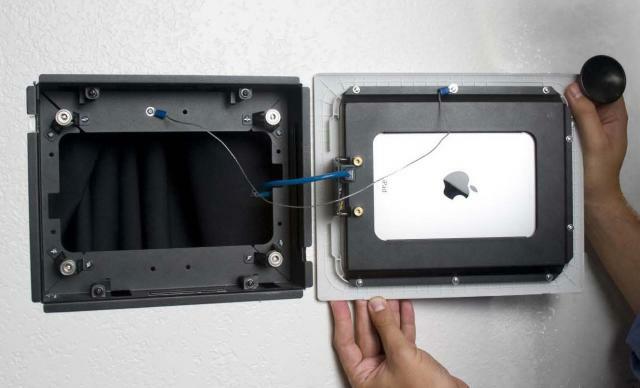 Allows Wi-Fi connection of the mounted iPad for downloads of Apps, audio content and certain upgrades. Supports the iPad as a semi-permanent fixture in a modern and elegant manner. Charges the iPad while it is mounted. iPad is mounted semi-permanently in the iPort. 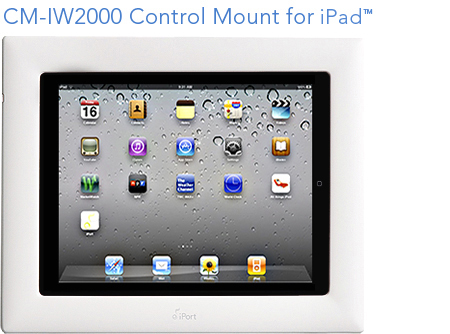 See related products for alternative 'ejectable' iPad wall mounts if you want to maintain the portable use of your iPad. This product is classed by the supplier as a 'Custom installer' class of product where installation is provided to customers - please select 'Custom Installation Included'. For Masonry installation a void and power outlet must be provided in the wall or a $300 wall chasing surcharge will apply (wall finishing is not included). Installation can be provided in all state capitals. Regional Buyers are very welcome and builders or those needing installation performed by their own building contractor (eg regional buyers) may purchase without installation after contacting us for design technical support and to discuss your project circumstances. please note: Physical Installation only - Suitable power cabling to the unit by electrician is quoted and charged separately.